A fully loaded chocolate bark is always a good call when it comes to DIY giftables. I'm a sucker for sweet and salty combinations so salted caramel and pretzels are my go-to. Toss the bark in a cute container and you've got yourself the perfect treat for friends, family, and colleagues. Right now is the season to be merry, but it's also prime time for festive stress. Up the ante this year by introducing a little sous vide cannabis-infused butter* into the recipe to take the edge off the holiday frenzy. Save this recipe for party treats or birthday gifts too! You can make this recipe friendly for everyone by replacing the cannabis butter with regular butter. Line a baking sheet with parchment paper or a silicone baking mat and preheat the oven to 375°F. Cover the baking sheet with crushed pretzel pieces and set aside. In a medium saucepan over medium heat, add salted butter, cannabis-infused butter, and light brown sugar. Gently stir until both butters have melted and the mixture reaches a slow bubble. Stop stirring and allow the mixture to boil untouched for 3-4 minutes, the color will turn a golden brown. Gently drizzle the caramelized mixture all over the crushed pretzels until the entire baking sheet is covered, it’s fine to have a few empty spots, the caramel will melt even more in the oven. Bake in the oven for 7 minutes. Remove from the oven and immediately add chocolate chips evenly over the top of the caramel and allow to melt for 1 minute. Using a rubber spatula, gently spread the melted chocolate evenly over the caramel. Finish with a light sprinkle of flaky finishing salt, like Maldon. 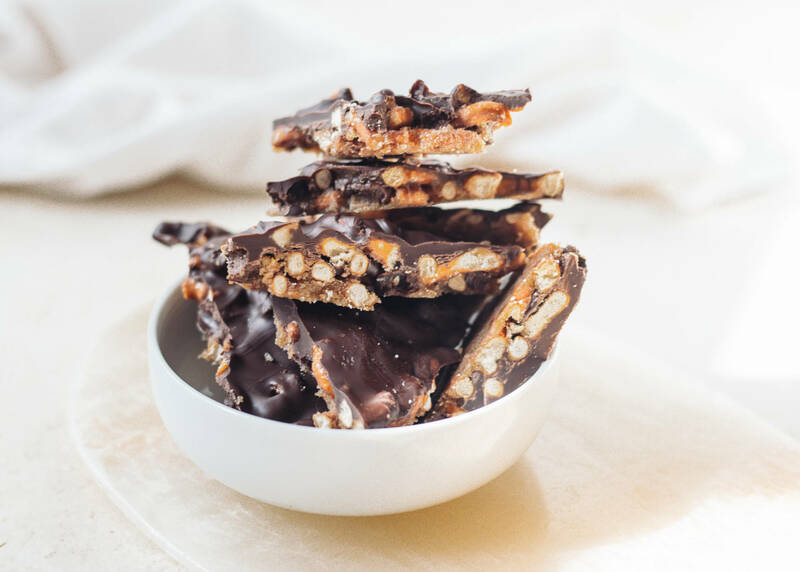 Cool to the touch in room temperature then refrigerate and let the salted caramel pretzel bark chill completely before breaking into 1 1/2", bite-sized pieces. *Please note: The amount of cannabis-infused butter specified in this recipe is a loose suggestion; the actual amount you use should be modified based on the strength of your butter and the potency you desire. Add regular butter in place of the medicated butter if you do not wish to consume any cannabis. Dosing homemade edibles can be tricky, so the best way to test for potency is to start with one portion of a serving and wait up to two hours before making an informed decision on whether to consume more. Always dose carefully and listen to your body, and never drive under the influence of cannabis.